As a compact and flexible ensemble, the Welsh Sinfonia aims to bring chamber music to the whole of Wales: reaching smaller venues and areas where live classical music provision is limited. The orchestra delivers exciting and vibrant performances, exploring the ever widening but little known orchestral chamber music repertoire. It combines a prestigious ‘Cardiff Series’ of concerts, touring and a successful, engaging and interactive education programme. The Welsh Sinfonia is committed to commissioning and premiering new works, most recently from Damian Rees ‘Happily Ever After’, Eilir Owen Griffiths ‘The Emoticons of Time’ (Percussion Concerto) and Rhian Samuel ‘The Path through the Woods’ (Recorder Concerto). There are developing links with emerging Welsh musicians including the Official Harpist to the Prince of Wales Claire Jones, Percussionist Dave Danford and world-renowned recorder soloist Pamela Thorby. 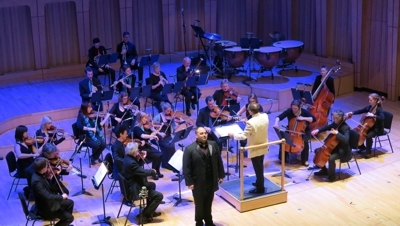 The orchestra also fosters the talents of graduates from the RWCMD, as well as offering an internship to a student on the Masters course in arts management. Lucy Campion currently holds this post. Opportunities to hear regular professional performances of works for chamber orchestra are rare in Wales and The Welsh Sinfonia is an important champion of this rich and diverse repertoire.